Pole Harmony: Freestyle Friday: Motivational January. Handstand Challenge. Freestyle Friday: Motivational January. Handstand Challenge. January is the month of new year's resolutions. Often times, these resolutions are centered around fitness as people decide to get a fresh new start for the new year when it comes to their health. Or if you've already established a regular fitness routine, you may find yourself reviewing your fitness goals for the year. Whatever your situation or reason, January generally brings about a renewed interest in accomplishing long sought after fitness goals. This month we decided to focus on handstands. Handstands are fun moves that can be practiced with or without a pole. They can be done in a variety of ways and initiate muscles that attribute to the essential muscles utilized in numerous pole and aerial moves. To go along with the new year theme, this month's challenge will also include a month long theme using the photo sharing social media site, instagram. If you'd like to participate, we'll be sharing a handstand photo a day via our instagram account @poleharmony. Can't commit to a photo a day? You can also participate with a weekly handstand photo. Just be sure to include the #poleharmony with your picture uploads. Have fun with this challenge. We hope your participation leads to the motivation you need to strengthen your handstands for strong and smooth execution. Join us in our Freestyle Friday January 10th at 7:30pm for our handstand themed class where you will learn a variety of handstand techniques, proper form, and how to integrate a handstand into your pole dancing routine. Click the button below to sign up via our online scheduling system. 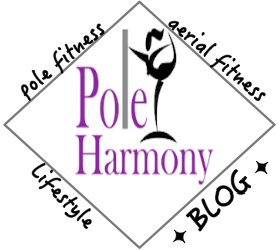 What to Expect in a Pole Dancing Fitness Class!